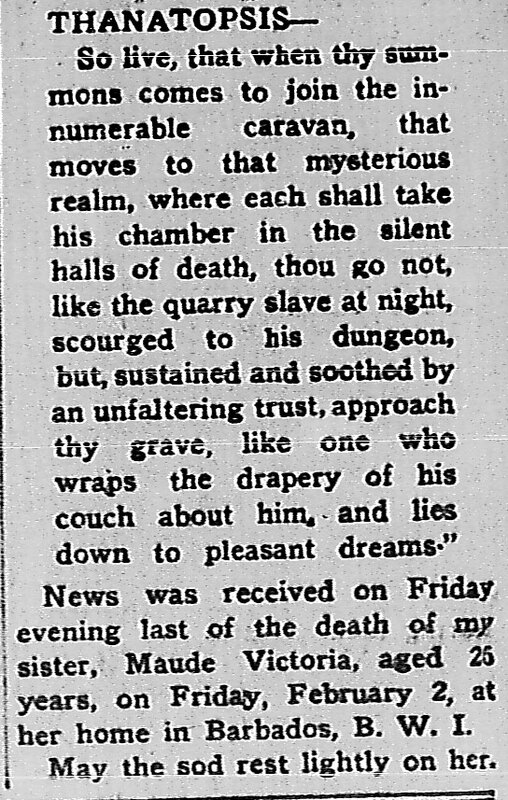 Scanning Ebenezer’s columns on a sleepy Sunday afternoon, my heavy eyelids were brought to attention by this line at the bottom of a column dated Feb. 24, 1934. I know about his brother, Noel (Alkins), also a newspaperman, who lived in Barbados; his mother, Malvina (Chase Alkins). And there was a niece, Carman Alkins, who I assumed was Noel’s child. Sad that Maude Victoria (no last name was given) died so young. I love that you keep receiving surprises from the past. And that you share them!